A stone tool is, in the most general sense, any tool made either partially or entirely out of stone. 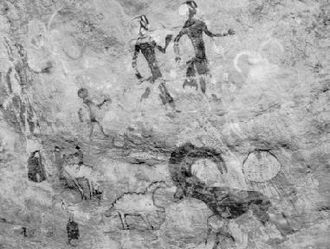 Although stone tool-dependent societies and cultures still exist today, most stone tools are associated with prehistoric (particularly Stone Age) cultures that have become extinct. Archaeologists often study such prehistoric societies, and refer to the study of stone tools as lithic analysis. Ethnoarchaeology has been a valuable research field in order to further the understanding and cultural implications of stone tool use and manufacture. Stone has been used to make a wide variety of different tools throughout history, including arrow heads, spearpoints and querns. Stone tools may be made of either ground stone or chipped stone, and a person who creates tools out of the latter is known as a flintknapper. Archaeologists classify stone tools into industries (also known as complexes or technocomplexes) that share distinctive technological or morphological characteristics. 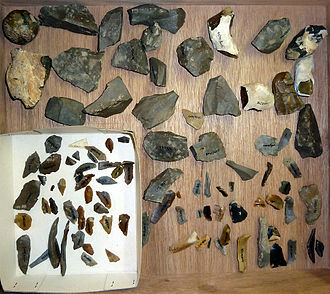 In 1969 in the 2nd edition of World Prehistory, Grahame Clark proposed an evolutionary progression of flint-knapping in which the "dominant lithic technologies" occurred in a fixed sequence from Mode 1 through Mode 5. He assigned to them relative dates: Modes 1 and 2 to the Lower Palaeolithic, 3 to the Middle Palaeolithic, 4 to the Advanced and 5 to the Mesolithic. 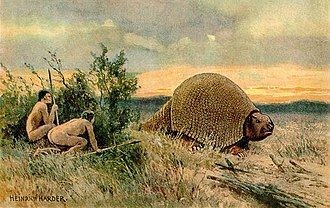 They were not to be conceived, however, as either universal—that is, they did not account for all lithic technology; or as synchronous—they were not in effect in different regions simultaneously. Mode 1, for example, was in use in Europe long after it had been replaced by Mode 2 in Africa. 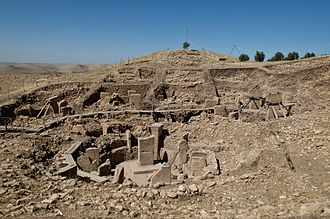 Clark's scheme was adopted enthusiastically by the archaeological community. One of its advantages was the simplicity of terminology; for example, the Mode 1 / Mode 2 Transition. The transitions are currently of greatest interest. Consequently, in the literature the stone tools used in the period of the Palaeolithic are divided into four "modes", each of which designate a different form of complexity, and which in most cases followed a rough chronological order. Stone tools found from 2011 to 2014 at Lake Turkana in Kenya, are dated to be 3.3 million years old, and predate the genus Homo by half million years. The oldest known Homo fossil is 2.8 million years old compared to the 3.3 million year old stone tools. 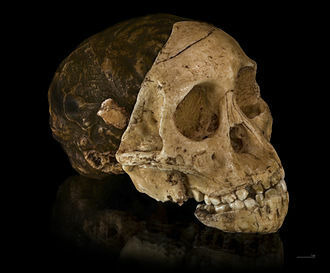 The stone tools may have been made by Australopithecus afarensis —also called Kenyanthropus platyops— (a 3.2 to 3.5-million-year-old Pliocene hominin fossil discovered in 1999) the species whose best fossil example is Lucy, which inhabited East Africa at the same time as the date of the oldest stone tools. Dating of the tools was by dating volcanic ash layers in which the tools were found and dating the magnetic signature (pointing north or south due to reversal of the magnetic poles) of the rock at the site. In contrast to an Oldowan tool, which is the result of a fortuitous and probably ex tempore operation to obtain one sharp edge on a stone, an Acheulean tool is a planned result of a manufacturing process. 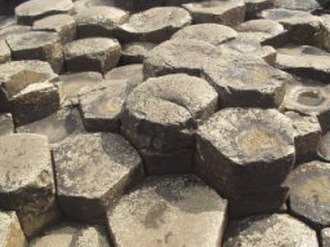 The manufacturer begins with a blank, either a larger stone or a slab knocked off a larger rock. From this blank he or she removes large flakes, to be used as cores. 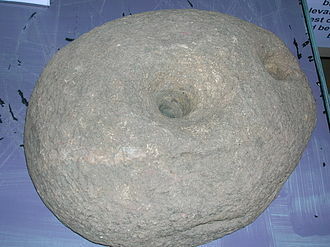 Standing a core on edge on an anvil stone, he or she hits the exposed edge with centripetal blows of a hard hammer to roughly shape the implement. Then the piece must be worked over again, or retouched, with a soft hammer of wood or bone to produce a tool finely chipped all over consisting of two convex surfaces intersecting in a sharp edge. Such a tool is used for slicing; concussion would destroy the edge and cut the hand. 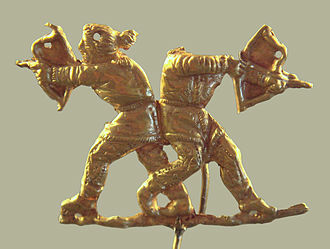 The widespread use of long blades (rather than flakes) of the Upper Palaeolithic Mode 4 industries appeared during the Upper Palaeolithic between 50,000 and 10,000 years ago, although blades were still produced in small quantities much earlier by Neanderthals  The Aurignacian culture seems to have been the first to rely largely on blades  The use of blades exponentially increases the efficiency of core usage compared to the Levallois flake technique, which had a similar advantage over Acheulean technology which was worked from cores. Mode 5 stone tools involve the production of microliths, which were used in composite tools, mainly fastened to a shaft. 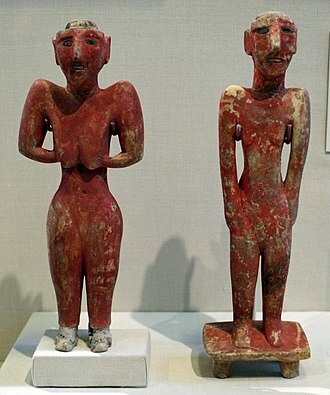 Examples include the Magdalenian culture. Such a technology makes much more efficient use of available materials like flint, although required greater skill in manufacturing the small flakes. Mounting sharp flint edges in a wood or bone handle is the key innovation in microliths, essentially because the handle gives the user protection against the flint and also improves leverage of the device. 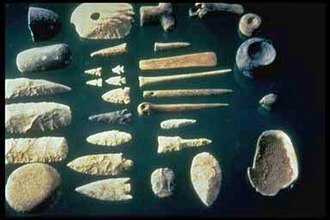 In prehistoric Japan, ground stone tools appear during the Japanese Paleolithic period, that lasted from around 40,000 BC to 14,000 BC. Elsewhere, ground stone tools became important during the Neolithic period beginning about 10,000 BC. These ground or polished implements are manufactured from larger-grained materials such as basalt, jade and jadeite, greenstone and some forms of rhyolite which are not suitable for flaking. The greenstone industry was important in the English Lake District, and is known as the Langdale axe industry. 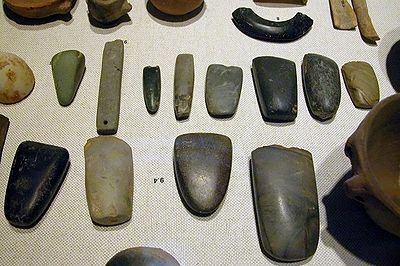 Ground stone implements included adzes, celts, and axes, which were manufactured using a labour-intensive, time-consuming method of repeated grinding against an abrasive stone, often using water as a lubricant. 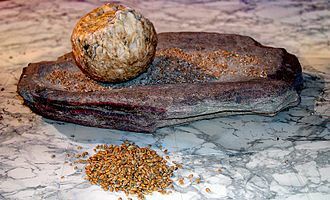 Because of their coarse surfaces, some ground stone tools were used for grinding plant foods and were polished not just by intentional shaping, but also by use. Manos are hand stones used in conjunction with metates for grinding corn or grain. Polishing increased the intrinsic mechanical strength of the axe. Polished stone axes were important for the widespread clearance of woods and forest during the Neolithic period, when crop and livestock farming developed on a large scale. They are distributed very widely and were traded over great distances since the best rock types were often very local. They also became venerated objects, and were frequently buried in long barrows or round barrows with their former owners. There were many sources of supply, including Grimes Graves in Suffolk, Cissbury in Sussex and Spiennes near Mons in Belgium to mention but a few. 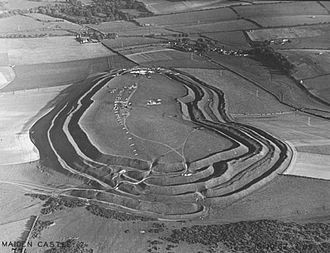 In Britain, there were numerous small quarries in downland areas where flint was removed for local use, for example. ^ Clarke, David (1978). Analytical Archaeology (2nd ed.). New York, NY: Columbia University Press. pp. 372–373. ISBN 0231046308. ^ Kadowaki, Seiji (2013). "Issues of Chronological and Geographical Distributions of Middle and Upper Palaeolithic Cultural Variability in the Levant and Implications for the Learning Behaviour of Neanderthals and Homo sapiens". In Akazawa, Takeru; Nishiaki, Yoshihiro; Aoki, Kenichi. 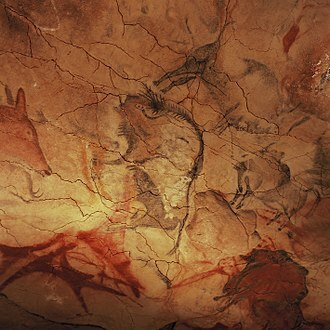 Dynamics of Learning in Neanderthals and Modern Humans Volume 1: Cultural Perspectives. Tokyo: Springer. pp. 62–63. ISBN 9784431545118. ^ Harmand, Sonia; Lewis, Jason E.; Feibel, Craig S.; Lepre, Christopher J.; Prat, Sandrine; Lenoble, Arnaud; Boës, Xavier; Quinn, Rhonda L.; Brenet, Michel (2015-05-20). "3.3-million-year-old stone tools from Lomekwi 3, West Turkana, Kenya". Nature. 521 (7552): 310–315. doi:10.1038/nature14464. ISSN 0028-0836. ^ Morelle, Rebecca (20 May 2015). "Oldest stone tools pre-date earliest humans". BBC News. Retrieved 2016-01-03. ^ Drake, Nadia; 20, for National Geographic PUBLISHED May. "Wrong Turn Leads to Discovery of Oldest Stone Tools". National Geographic News. Retrieved 2015-05-21. ^ Harmand, Sonia; Lewis, Jason E.; Feibel, Craig S.; Lepre, Christopher J.; Prat, Sandrine; Lenoble, Arnaud; Boës, Xavier; Quinn, Rhonda L.; Brenet, Michel (May 21, 2015). "3.3-million-year-old stone tools from Lomekwi 3, West Turkana, Kenya". Nature. 521 (7552): 310–315. doi:10.1038/nature14464. ISSN 0028-0836. PMID 25993961. ^ Thompson, Helen. "The Oldest Stone Tools Yet Discovered Are Unearthed in Kenya". Retrieved 2015-05-21. ^ Wilford, John Noble (2015-05-20). "Stone Tools From Kenya Are Oldest Yet Discovered". The New York Times. ISSN 0362-4331. Retrieved 2015-05-30. ^ "Oldest Known Stone Tools Discovered: 3.3 Million Years Old". video.nationalgeographic.com. Retrieved 2015-06-15. ^ "Nature Index". 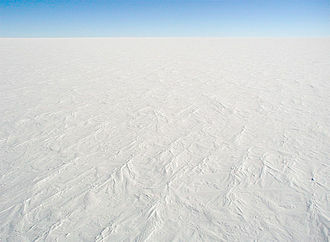 www.natureindex.com. Retrieved 2016-04-05. ^ Shannon P. McPherron; Zeresenay Alemseged; Curtis W. Marean; Jonathan G. Wynn; Denné Reed; Denis Geraads; René Bobe; Hamdallah A. Béarat (2010). "Evidence for Stone-tool-assisted Consumption of Animal Tissues before 3.39 Million Years Ago at Dikika, Ethiopia". Nature. 466 (7308): 857–860. doi:10.1038/nature09248. PMID 20703305. 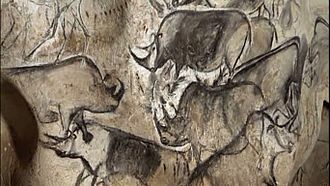 ^ "Scientists Discover Oldest Evidence of Stone Tool Use and Meat-Eating Among Human Ancestors". Archived from the original on 3 December 2013. Retrieved 27 November 2013. ^ Clarke's "chopper tools and flakes." ^ Semaw, S.; M. J. Rogers; J. Quade; P. R. Renne; R. F. Butler; M. Domínguez-Rodrigo; D. Stout; W. S. Hart; T. Pickering; S. W. Simpson (2003). "2.6-Million-year-old stone tools and associated bones from OGS-6 and OGS-7, Gona, Afar, Ethiopia". Journal of Human Evolution. 45: 169–177. doi:10.1016/S0047-2484(03)00093-9. PMID 14529651. ^ Clarke's "bifacially flaked hand axes." ^ Clarke's "flake tools from prepared cores." ^ Lewin, R.; Foley, R. A. (2004). Principles of Human Evolution (2 ed.). UK: Blackwell Science. p. 311. ISBN 0-632-04704-6. 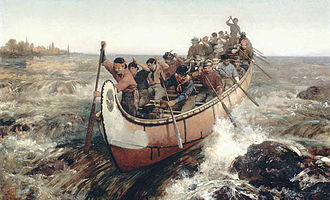 ^ Clarke's "punch-struck blades with steep retouch." ^ Clarke's "microlithic components of composite artifacts." Michaels, George H.; Fagan, Brian M. (1990–1998). "Principles of Lithic Technology". University of California. Retrieved 22 January 2011. Gunness, Jo Lynn (1998). "Lithic Technologies Notes". University of Hawaii Anthropology Department. Archived from the original on 13 June 2001. Retrieved 22 January 2011. Prindle, Tara (1994–2011). "Flaked Stone Tool Technology". Nativetech.org. Retrieved 22 January 2011. "Typology". Stone Age Reference Collection (SARC), University of Oslo. Archived from the original on 5 February 2006. Retrieved 22 January 2011. 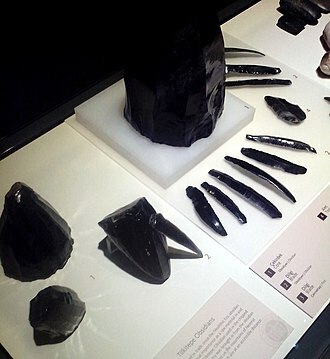 "Stone Tools of Texas Indians". Texas Beyond History, University of Texas at Austin. 2001. Retrieved 18 January 2011. Prindle, Tara (1994–2011). "Common Stone Types and Northeastern Lithic Technologies". Nativetech.org. Retrieved 18 January 2011. Grace, Roger. "Interpreting the Function of Stone Tools". Stone Age Reference Collection (SARC), University of Oslo. Archived from the original on 29 May 2010. Retrieved 18 January 2011. "How to recognize prehistoric stone tools". 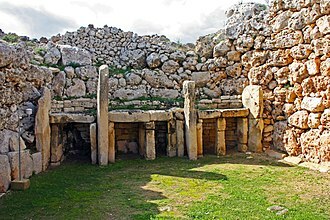 newarchaeology.com. Archived from the original on 6 September 2006. Retrieved 18 January 2011. "The World Museum of Man and Prehistory". World Museum of Man. 2004–2011. Retrieved 18 January 2011. English Heritage. "Globalising archaeology: producing tools in the Neolithic". Google Arts & Culture. Retrieved 19 August 2018. Radiolarite is a siliceous, comparatively hard, fine-grained, chert-like, and homogeneous sedimentary rock that is composed predominantly of the microscopic remains of radiolarians. This term is used for indurated radiolarian oozes and sometimes as a synonym of radiolarian earth. However, radiolarian earth is regarded by Earth scientists to be the unconsolidated equivalent of a radiolarite. 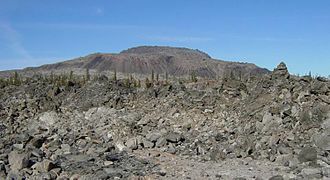 A radiolarian chert is well-bedded, microcrystalline radiolarite that has a well-developed siliceous cement or groundmass, radiolarites are biogenic, finely layered sedimentary rocks. 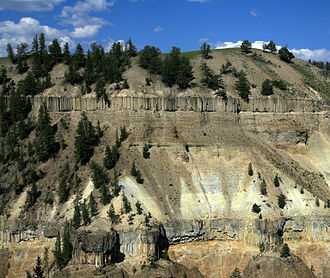 The layers reveal an interchange of clastic mica grains, radiolarian tests, clay minerals are usually not abundant. Radiolarites deposited in shallow depths can interleave with carbonate layers. Yet most often radiolarites are pelagic, deep water sediments, radiolarites are very brittle rocks and hard to split. They break conchoidally with sharp edges, during weathering they decompose into small, rectangular pieces. The colors range from light to dark via red, radiolarites are composed mainly of radiolarian tests and their fragments. The skeletal material consists of amorphous silica, radiolarians are marine, planktonic protists with an inner skeleton. Their sizes range from 0.1 to 0.5 millimeters, amongst their major orders albaillellaria, the spherical spumellaria and the hood-shaped nassellaria can be distinguished. According to Takahashi radiolarians stay for 2 to 6 weeks in the zone before they start sinking. Their descent through 5000 meters of water can take from two weeks to as long as 14 months. As soon as the protist dies and starts decaying silica dissolution affects the skeleton, the dissolution of silica in the oceans parallels the temperature/depth curve and is most effective in the uppermost 750 meters of the water column, farther below it rapidly diminishes. Upon reaching the interface the dissolution drastically increases again. Several centimeters below this interface the dissolution continues within the sediment and it is in fact astonishing that any radiolarian tests survive at all. It is estimated that only as little as one percent of the skeletal material is preserved in radiolarian oozes. 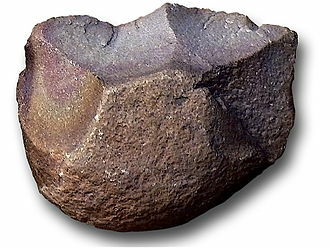 A hand axe is a prehistoric stone tool with two faces that is the longest-used tool in human history. 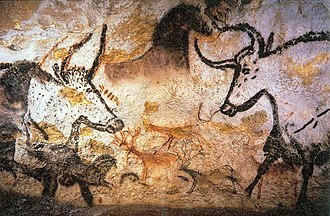 It is usually made from flint or chert and it is characteristic of the lower Acheulean and middle Palaeolithic periods. Its technical name comes from the fact that the model is a generally bifacial Lithic flake with an almond-shaped shape. Hand axes tend to be symmetrical along their axis and formed by pressure or percussion. The most common hand axes have an end and rounded base, which gives them their characteristic shape. Hand axes are a type of the somewhat wider biface group of two-faced tools or weapons, Hand axes were the first prehistoric tools to be recognized as such, the first published representation of a hand axe was drawn by John Frere and appeared in a British publication in 1800. Until that time, their origins were thought to be natural or supernatural and they were called thunderstones, because popular tradition held that they had fallen from the sky during storms or were formed inside the earth by a lightning strike and appeared at the surface. They are used in rural areas as an amulet to protect against storms. Hand axe tools were used to butcher animals, to dig for tubers and water, to chop wood and remove tree bark, to throw at prey. Four classes of hand axe are,1, thick hand axes reduced from cores or thick flakes, referred to as blanks 2, French antiquarian André Vayson de Pradenne introduced the word biface in 1920. The expression faustkeil is used in German and it can be literally translated as hand axe, although in a stricter sense it means fist wedge. It is the same in Dutch where the expression used is vuistbijl which literally means fist axe, the same locution occurs in other languages. However, the impression of these tools were based on ideal pieces that were of such perfect shape that they caught the attention of non-experts. Their typology broadened the terms meaning, biface hand axe and bifacial lithic items are distinguished. A hand axe need not be an item and many bifacial items are not hand axes. 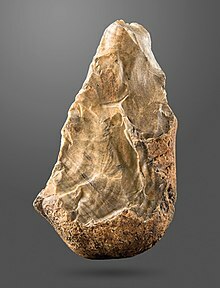 Nor were hand axes and bifacial items exclusive to the Lower Palaeolithic period in the Old World and they appear throughout the world and in many different pre-historical epochs, without necessarily implying an ancient origin. The bow and arrow is a projectile weapon system that predates recorded history and is common to most cultures. Archery is the art, practice, or skill of applying it, a bow is a flexible arc that shoots aerodynamic projectiles called arrows. A string joins the two ends of the bow and when the string is drawn back, the ends of the bow are flexed, when the string is released, the potential energy of the flexed stick is transformed into the kinetic energy of the arrow. Archery is the art or sport of shooting arrows from bows, today and arrows are used primarily for hunting and for the sport of archery. Someone who makes bows is known as a bowyer, and one who makes arrows is a fletcher —or in the case of the manufacture of arrow heads. 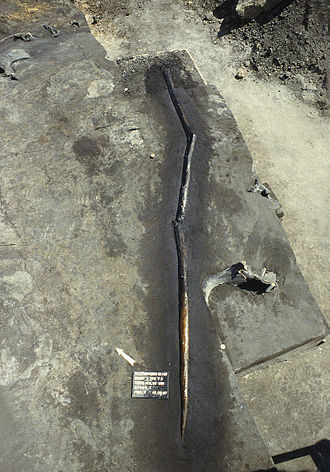 The bow and arrow appears around the transition from the Upper Paleolithic to the Mesolithic, at the site of Nataruk in Turkana County, obsidian bladelets found embedded in a skull and within the thoracic cavity of another skeleton, suggest the use of stone-tipped arrows as weapons. 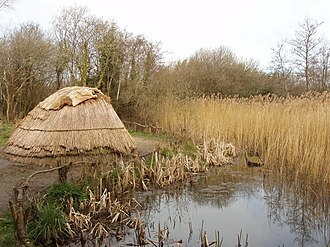 After the end of the last glacial period, use of the bow seems to have spread to every inhabited continent, including the New World, the oldest extant bows in one piece are the elm Holmegaard bows from Denmark which were dated to 9,000 BCE. High-performance wooden bows are made following the Holmegaard design. Microliths discovered on the south coast of Africa suggest that arrows may be at least 71,000 years old, the bow was an important weapon for both hunting and warfare from prehistoric times until the widespread use of gunpowder in the 16th century. Organised warfare with bows ended in the mid 17th century in Europe, the British upper class led a revival of archery from the late 18th century. Sir Ashton Lever, an antiquarian and collector, formed the Toxophilite Society in London in 1781, under the patronage of George, the basic elements of a bow are a pair of curved elastic limbs, traditionally made from wood, joined by a riser. Both ends of the limbs are connected by a known as the bow string. Radiolarite (Jurassic) from the Alps. Mookaite from the Kennedy Ranges, near Gascoyne Junction, Western Australia in the permanent collection of The Children’s Museum of Indianapolis.